Perhaps the reason this song has been so universally included in hymnals is that it reminds discouraged Christians of the grace they have been given. It is often easy to take a negative view of life, but when we remember the things we have been given, we cannot deny that we are blessed. 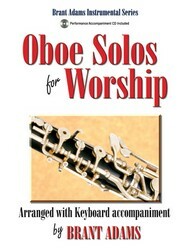 The hymn proclaims that all power belongs to God, and that he desires to bless us. The lyrics for this hymn are related to several scripture passages: Psalm 40:5-6; Psalm 107:31; Ephesians 1:3; and 1 Thessalonians 5:18. The text for “When Upon Life’s Billows you are Tempest Tossed” was written in 1897 by Johnson Oatman. 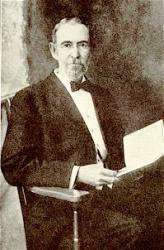 Growing up, Oatman realized that he would never be a great singer or preacher, but he eventually discovered his passion: hymn writing. He became a prolific writer and wrote over 5000 hymns throughout his lifetime. Most hymnals published today have at least one of his songs. Instead of being discouraged by his lack of musical oratory skills, Oatman found hope in his ability to write. The tune for “When Upon Life’s Billows you are Tempest Tossed,” BLESSINGS, was written in 1897 by Edwin O. Excell. Like his collaborator Johnson Oatman, Excell produced a massive amount of work over the course of his lifetime—over 2000 songs. 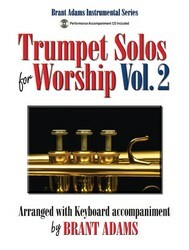 The tune is bright and uplifting, supporting the lyrics with bright hopeful notes. This hymn would work well around Thanksgiving, but could easily be incorporated into other services. The song should be played at a brisk tempo, not rushing, but moving quickly along. Display Title: Count Your Blessings First Line: When upon life's billows you are tempest tossed Tune Title: [When upon life's billows you are tempest tossed] Author: Rev. J. Oatman, Jr. Display Title: Count your blessings, name them one by one First Line: When upon life's billows you are tempest tossed Tune Title: [When upon life's billows you are tempest tossed] Author: Johnson Oatman, Jr. 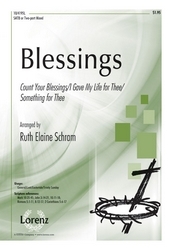 Display Title: Count Your Blessings First Line: When upon life's billows you are tempest tossed Tune Title: [When upon life's billows you are tempest tossed] Author: Johnson Oatman, Jr. 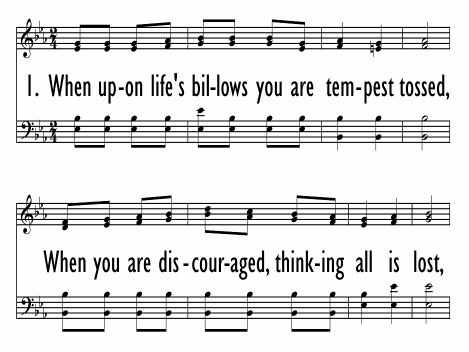 Source: Songs for Young People, by Edwin Excell (Chicago, Illinois: Curts & Jennings, 1897), number 34.